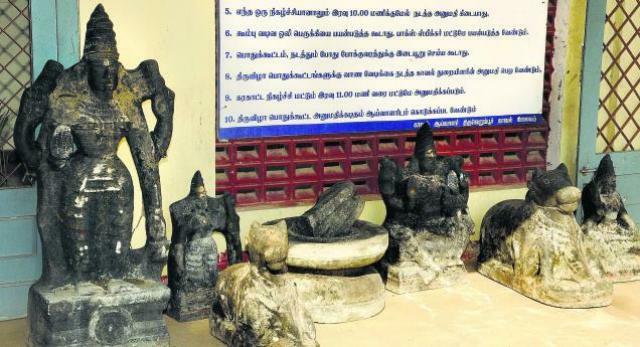 Police recovered 7 smuggled stone idols of hindu gods from cauvery river near Thiruverumbur, which are suspected to have been stolen for selling out of India. It is assumed that smugglers might have stolen these idols to transport them out of the country, but fearing the recent crack down in chennai on idol smuggling, they must have abandonded them in the river. Local people fishing in the river alerted the cops about these idols. Biggest among them was a 4 feet tall idol of goddess Amman, a 2.5 feet tall idol of Ambal leaning on to Swamy, two Nandi statues each around 2 feet tall, a statue of Manmadan, a damaged Siva linga apart from a small Amman statue. All these idols are oiled, indicating that they were used in regular pooja activities in respective temples. Police are yet to trace the origins of these idols. It is suspected that many original idols have already been smuggled out of India and duplicates have replaced them and hidden under disguise of sandalwood paste etc. Officers of the Idol Wing-CID attached to the Economic Offences Wing (EOW) found huge haul of idols from a warehouse in Venus Colony off Murrays Gate Road in Alwarpet, Chennai. 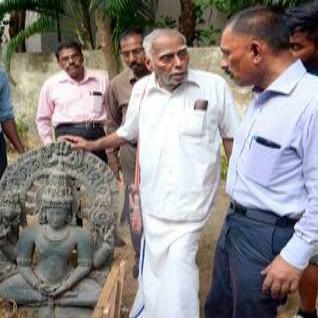 Upon searching, police found several crates containing idols and antique items shipped from Thiruvananthapuram through an art gallery in Mumbai. Many idols made of blackstone were likely over 900 years old and worth several millions of rupees. had secured 71 stone idols, 41 metal idols, 90 paintings and an ivory item from this place. Accused was running art galleries in four places in the Tamil Nadu and one in Karnataka. In the past, India lost many of its original sculptures, paintings etc to europeans during british rule. Now, in independent India, idols from temples are being smuggled with ease. Ancient Hindu Temple at Mohalla Wangri Gran, Peshawar secretly demolished !